Powering skin’s beauty, now and over time. 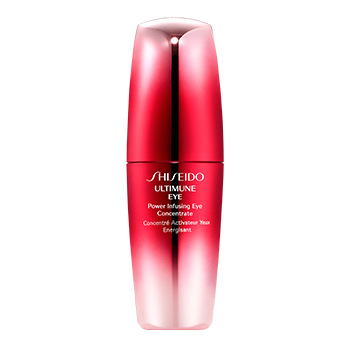 ~ Shiseido’s exclusive Ultimune Complex™* is formulated with Bulgarian Rose Water, Aqua In Pool and Yeast to help protect, strengthen, and maintain healthy looking skin. ~ New ImuMoisture Extract™ helps enhance the effects of Ultimune Complex™ to uniquely strengthen the delicate skin around the eye area. ~ Formulated with a unique botanical power blend of Gingko Biloba Leaf Extract, Shiso and Thyme. ~ For women of all skin types and all ages. ~ In 4 weeks: Skin around the eye looks healthier, firm and more resilient. Fine lines and wrinkles are less visible and the appearance of dark circles becomes visibly reduced. To use: Apply morning and evening after cleansing, balancing skin and applying Ultimune Power Infusing Concentrate. Follow with eye cream that addresses targeted concerns. FOR ALL SKIN TYPES. DERMATOLOGIST-TESTED. OPHTHALMOLOGIST-TESTED.